For many, taking the GMAT might be the most nerve-wracking part of the business school application process — particularly if you think of yourself as a bit math-challenged. But don’t panic. With study and planning you can be well-prepared for the challenge. The GMAT exam of four main sections: Analytical Writing Assessment, Integrated Reasoning, Quantitative and Verbal. The exam is offered year-round and on demand in test centers around the world. The Analytical Writing Assessment (AWA) is designed to measure your ability to think critically and to communicate your ideas. It consists of one 30-minute essay for which you will be asked to analyze the reasoning behind a given argument and write a critique of that argument. You are not being asked to present your own views on the subject. The Integrated Reasoning section is the newest section of the test and will assess our abilities to synthesize information presented in graphics, text and numbers; evaluate relevant information from different sources; organize information to see relationships and solve multiple, interrelated problems; and combine and manipulate information to solve complex problems that depend on information from one or more sources. The Quantitative section — also known as the “math” section — measures your ability to reason quantitatively, solve quantitative problems and interpret graphic data. It consists of two types of questions: problem-solving and data-sufficiency. Both types of questions require knowledge of arithmetic, elementary algebra and commonly known concepts of geometry. In the Verbal section, three types of multiple-chose questions are used to assess reading comprehension, critical reasoning and sentence correction. Throughout this section, you will be asked to read and comprehend written material, reason and evaluate argument sand correct written material to conform to standard written English. Taking practice tests will help you understand your current skill levels and where you need to focus your study efforts. For any areas in which you find yourself deficient, consider taking one of the many test-prep courses available either online or in a live, group format. Most GMAT test takers start preparing three to six months before the actual test date. Think about you can best prepare, given your discipline, motivation and personal preferences. Your unofficial score report will be available immediately after the test. Official score reports are available online within 20 days to you and to the programs you requested to receive them. If you’re not satisfied with your score, you can take the test up to five times within a 12-month period. 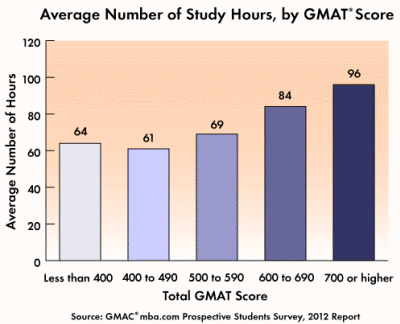 To schedule your exam and learn more about the GMAT, visit MBA.com. Although the GMAT is still the most widely accepted standardized test by business schools, many consider additional tests as part of their admissions process. For more information on the GRE revised General Test, visit ETS. If English is not your native language and you are looking to attend business school where the language of instruction is English, some schools may require you take the TOEFL iBT test. The TOEFL iBT measures your ability to use and understand English at the university level. And it evaluates how well you combine your listening, reading, speaking and writing skills to perform academic tasks. For more information on the TOEFL IBT test, visit ETS. Similar to the TOEFL iBT test, the International English Language Testing System (IELTS) assesses the English language proficiency of people who want to study or work where English is used as the language of communication. IELTS test all four language skills — listening, reading, writing and speaking. The IELTS Speaking test is a face-to-face interview with a certified Examiner. For more information on the IELTS test, visit IELTS.